but open on Saturday 22nd from 11.00 to 13.00 hrs. The Project will then be closed until Tuesday 8th January 2019. 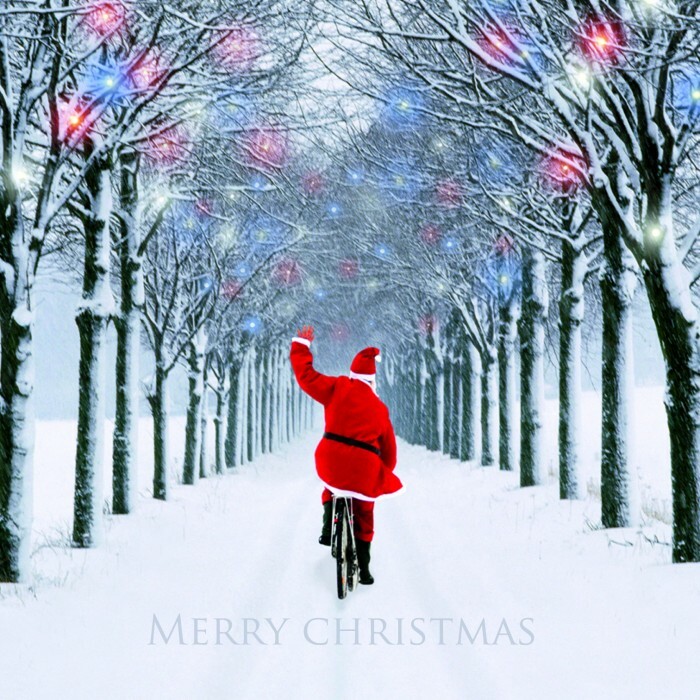 Merry Xmas and a happy new year to all our volunteers and customers. Sorry but due to Volunteer train off site, the project will be close until Saturday 24th November. A Rolling Bicycle Wheel Gathers No Rust! We aim to be operational by the first week of December, therefore during the move if you would like to see and try a bike we have for sale or require a service or repair, please call 07871103357 to arrange a suitable time. Please note our new opening times. Our opening hours are not consistant at the moment as we are still setting up the workshop. If you wish to visit therefore, please call Phil 07871103357 for opening times. Time to get those bikes out of the shed and serviced, or have a look at the range of fully refurbished bikes we have in stock. Bikes Revived wish to congratuale the Cycling team for a fantastic achievement in Rio. On Saturday 23rd of July , we will be at the Leigh Flower show. 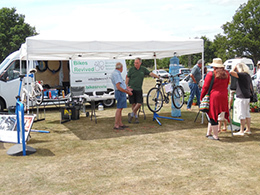 Its a great village show with lots of events and of course you can get your bike MOT'ed and have gears and brakes tuned up. 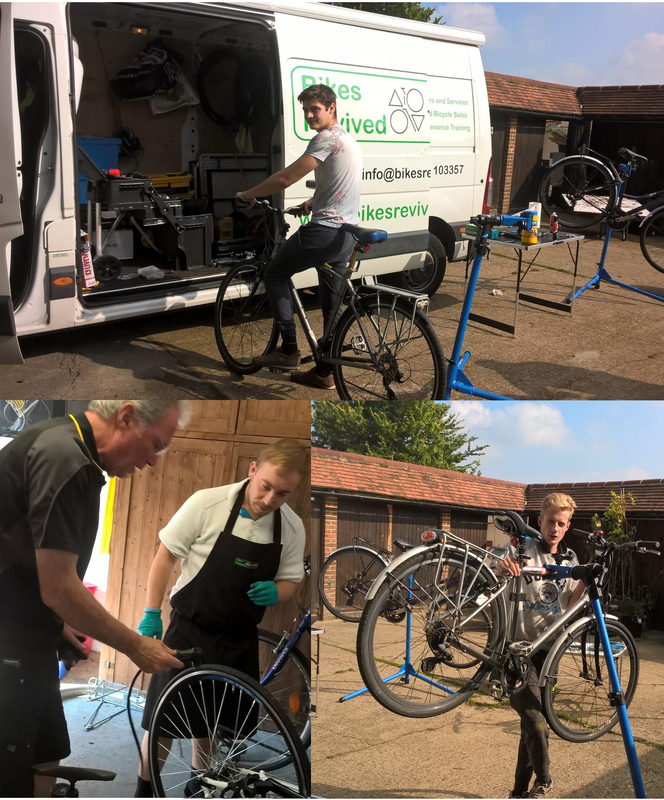 Thanks to Travel Smart funding from Surrey County Council, we have been able to train some of our volunteers to achieve cycling Industry standard CYTECH level one theory certification. Jay (Right) and Max are two of our latest passes. 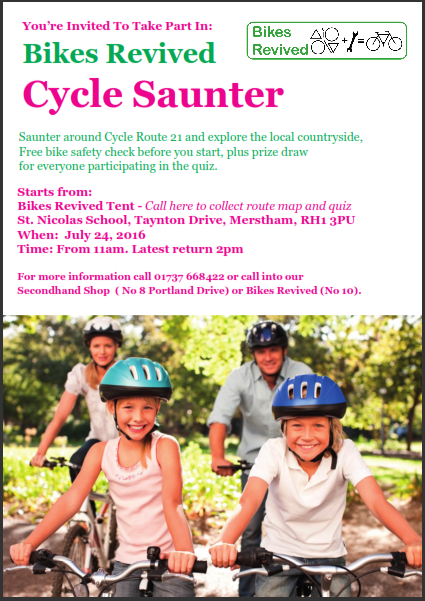 We'll be carrying out free bike safety checks plus gear and brake tune ups at the great event and day out. Here at Bikes Revived we have a very busy spring & Summer. Please download the pdf and join us at one of these events. 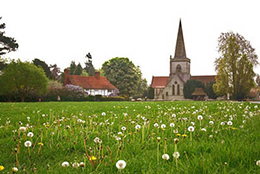 Saunter around Cycle Surreys Route 21 and explore the local countryside. 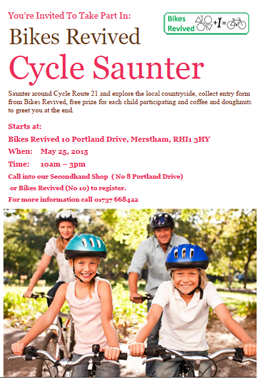 Prize for each child participating and coffee and doughnuts to greet you at the end. Bit dusty, gears and brakes not quite set right. Drop your bike into us. We will MOT it for you. 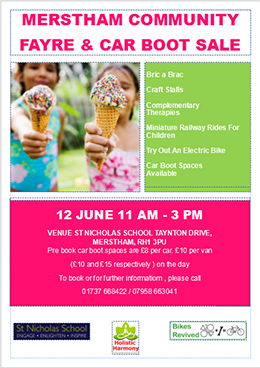 Come and join us in family day, next month. 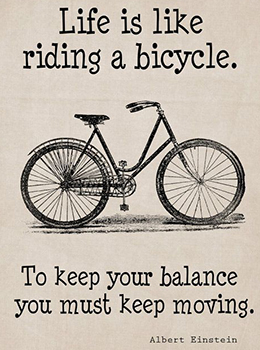 Dont worry if your bike is a bit poorly ... find us there and we will fix it for you. 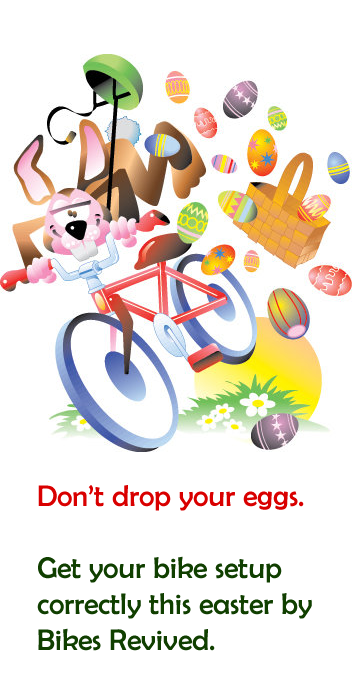 If some of your family don't have bikes you can buy or rent second-hand fully reconditioned bikes from us. See you there. Phil. 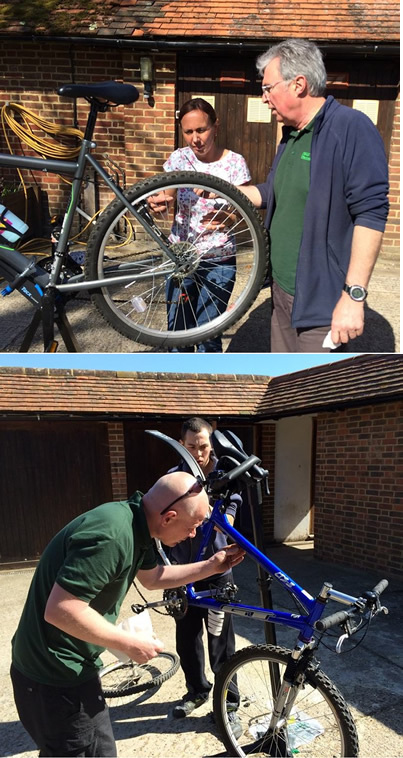 In April, Surrey Care Trust invited us to provide bicycle maintenance training for the Amber Project in Ockley.We had two sessions with enthusiastic participants who discovered untapped skills and expertise. Hopefully a few more recruits. 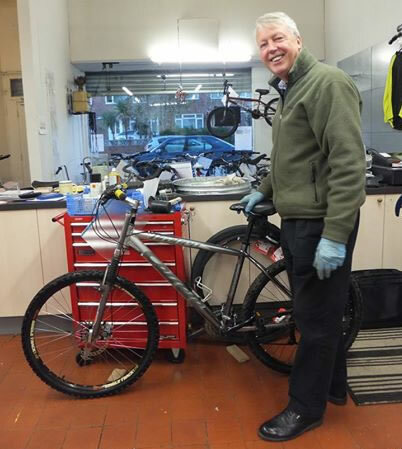 Our Latest Volunteer Surrey County Councillor Bob Gardener, Who not only fixes bikes for the project, but also donate bikes as well! Thanks Bob. 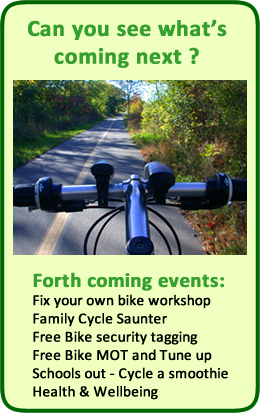 Announcing the start of the �Fix your Bike Evenings� Starting on Thursday 3rd October we will have to workshop open from 16.00 hrs to 19.30 hrs to enable anyone with a bike to pop along and use the workshop facilities, bike stands, tools etc. If you need advice there will be a qualified bike mechanic on hand to help. The cost per session is �5, which includes the use of tools, tea / coffee, oil and grease. If you are interested in coming along please call Phil to book a place on 07871103357. September 2013. 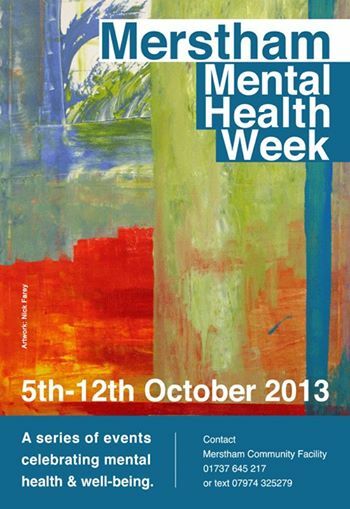 We took part in the Merstham Mental Health week, kicking off with a Dr Bike session between 11am and 2 pm at the 'Keeping Happy and Healthy Emotional Well-Being Event' at Church of the Epiphany Hall. 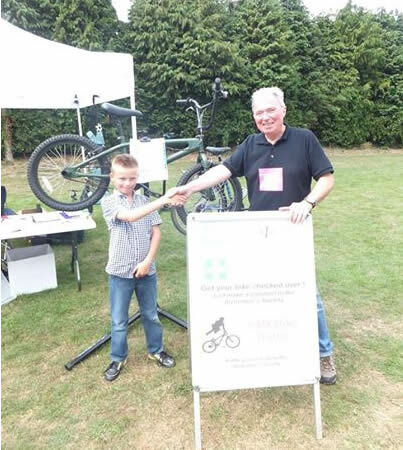 We attended a Community Charity open day at Mertham Football Club, where one of our lovingly restored bikes was raffled to support Alzheimers Society. Callum was the lucky raffle winner. 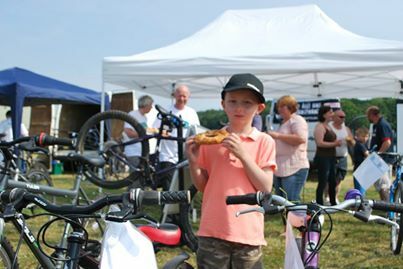 We also offered a free bike health check to any one who brought along their bikes. What a busy day that was! For anyone who wasnt able to bring their bike along we were able to run through the bike check process on one of our bikes which set up with deliberate faults. 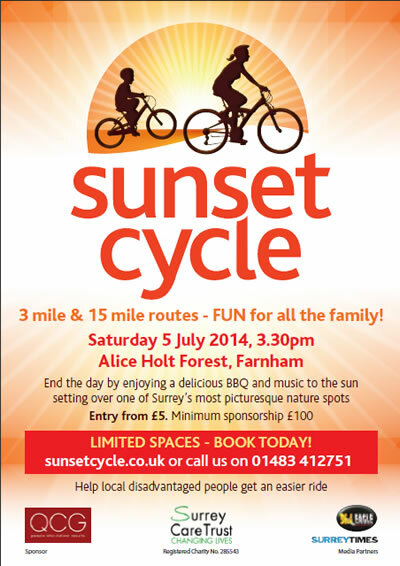 Summer July 2013 Surreys Super Cycle weekend. 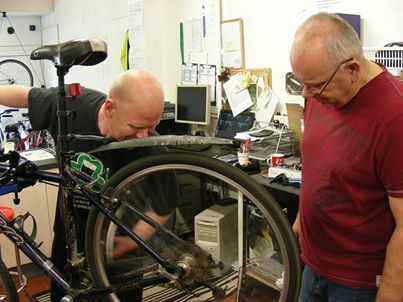 Bikes Revived gave on site support and maintenance to all who wish for help.